This is my 31st installment of Babywearing Stories 365. Each installment features a babywearer in 1 photograph and their answers to 5 questions. My goal is to normalize, promote and celebrate daily Babywearing, moving beyond *what* we use to carry our babies and shifting focus back on *why* and *where* we carry. I hope to share the stories of moms, dads, and babywearing caregivers all over the world. Enjoy! This is me, Hilary and my oldest son Camden who is 3.5 in the picture. I have worn Camden since he was a baby and still occasionally wear him as a little boy. This is Camden’s 3rd time at the Summer Camp Music Festival. He loves to go to concerts with us and babywearing makes it easy for him and his little brother to come along. This carrier is the Onya. I purchased it to use with Camden’s younger brother and found it worked just as well for him too! 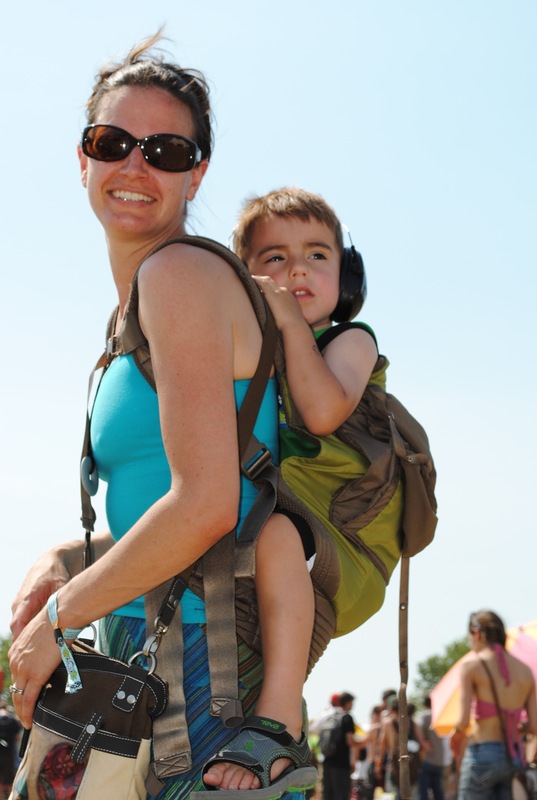 Babywearing is a must at concerts and festivals, it makes it easier to get around in large crowds and to haul tired out kiddos!